Thanks everybody for the words of encouragement, I’m happy to hear that you all wait for the new pictures to arrive :) Now it’s the time to switch again to another kind of project. Before taking every picture I’ll shortly explain why it is important to me to take it at all. It’s not easy, since I don’t come across important things every day, but maybe it also helps to see value in mundane things and activities. I also switch to English for this project, so if you see any mistakes, don’t hesitate to correct them in the comments! So I had this problem with my wrist, and I went to see the doctor. He hold it in his hands and asked why is it so yellow. Do I eat a lot of carrots? No, my diet is quite diverse, thanks for asking. Long story short, I’m not anaemic anymore. And I feel a completely different person now. After fifteen years judging myself as a lazy slow runner, I found out that exercise really was harder for me than everyone else. Now I’m a slow runner still, but I feel much better and can even enjoy the process. Hay’s Galleria has a typical south London history. Long ago, when Southwark was outside of the reach of the City government, it was a place for fun: taverns, theatres, and, well, nightclubs were clustered along the south bank of Thames. A typical brewery from that times was then rebuilt into a typical dock. 80% of tea import passed through this wharf to London. Also typically, it was consumed by fire and bombed in Second World War. The floor and glass roof were built only in the 1980s, when, not surprisingly, the dock was rebuilt to suit offices and living property. When we were moving to London, I was prepared to live in a concrete jungle. But it turned out there are other jungles here as well; in fact, 47% of the city area is green. I imagine it is quite an achievement for the place where real estate prices are soaring. Yet it helps to appreciate summers in the huge city much more. After a long period of heat over London, the thunderstorm clouds gather over Shard. While runners stop to take a breath of fresh air, Met Office warns that this summer’s high temperatures might be normal within a few decades. Thames barrier was built in 1984 to save central London from flood damages. It has a clever construction, which allows to stop tidal water, but lets the river sink underneath in a controlled way. It was closed 179 times to prevent flood both from the sea and Thames itself. The number of closures grow significantly every decade, starting with just 4 in eighties. In 2013-14 season it was closed 50 times, the maximum it can be used without damage. Environment agency predicts that with the rise of the sea level it would be a good idea to build a second barrier by 2070. ‘I really have to do something, but I’m already in my pajamas’. It’s interesting to see how a simple change of clothes influences our minds. Here I was, full of energy, doing sports, chatting with people. And the moment I put on my home clothes I become tired unsociable person and nothing cheers me better than a sight of a sofa. 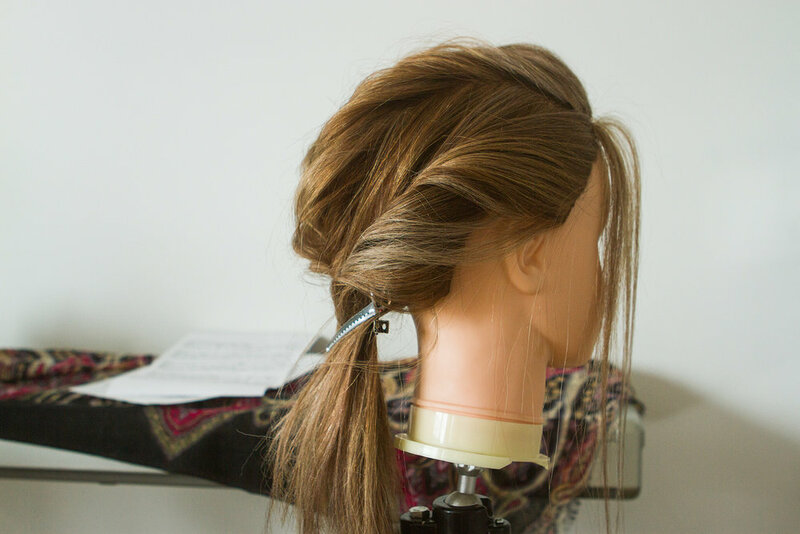 This is a dummy that my friend hairdresser uses to learn how to do a haircut or to make a certain hair style. She says that the fashion had changed lately, and elaborate flawless hairstyles gave way to more chaotic DIY looks, which in fact are more difficult to achieve. She had spent 6 hours plaiting this style and still is not happy with the result. But next time she will do it perfectly well.